Deejay, a combination of hobby and passion! I started listening to music from an early age thanks to the knowledge that my parents had and from there I did my research more and more in depth on certain musical genres from the Rock N Roll to the 70s Disco Music, from the 80s to the Electronics of Depeche Mode, from Rap Old School to Hip Hop, from Acid House to the 90s Dance to Deep House & Soulful! I started doing the Deejay with the first parties made with friends for their birthdays until 1997 when in February I met my great friend Enzo Lipari at L'Absolute in Messina where I introduced myself and asked if he needed support for some evening in the club. From that moment everything changed. I had my chance to make everyone feel my musical taste! A great emotion that made me understand that I can like musical choices. Closed the winter season I had confirmation for the summer season at "La Vecchia Noce" in Acqualadrone (ME) and this for two years in a row. In 1999 I had the honor of inaugurating for the winter season the local "The Last Beach" in Torre Faro (ME), it was a hit. The year 2000 began to great with the New Year with the inauguration at the San Filippo Altarpiece with my participation together with Piero Pelù of Litfiba band and the Gemelli Diversi. The year 2000 was also the year of my temporary abandonment of this fantastic world of the Discos because I joined the world of work too, but this did not make me lose my passion for music and I kept on being updated continuing to buy cd. This absence lasted for several years but some evening I always did for the Capodanni especially. 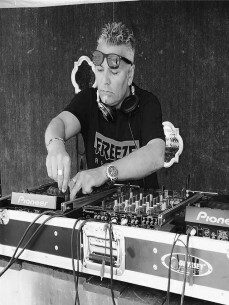 Until I ended up in Belluno in 2006, for work reasons, and had the opportunity to meet a deejay named Nicola who gave me the opportunity to enter for some event in the local area. In 2007 I arrived at the premises where I now live, in Lamezia Terme (CZ) and here too I had the opportunity to perform since the beginning of the summer at the local Henry Morgan in the locality "Marinella". From there to today, I'm having the opportunity to perform in several clubs in the area of Lamezia, including Kudetà Exclusive Buddha Bar, Carta Blanca and Narghilia. In 2013 I had the opportunity to perform again in Messina at the Hangover Café of my friend Rosario Costa to which my great thanks go. 2014 is an extraordinary year for me because in addition to performing between Lamezia and Messina I had a great opportunity going to Miami at the Winter Music Conference and perform at the local Dal Bull Point in Lincoln Road Avenue and a special thanks go two great DeeJay who are Leo Lippolis and Giulio Bonaccio who gave me this possibility with the addition that my performance was broadcast in Streaming worldwide on the Radio HouseStationRadio website. Great emotion and great stage of my life that has opened new musical horizons that I am following to today. 2015 is an amazing year and started in the best way with the return to Miami and where I had the opportunity to play for the duration of the 30th Winter Music Conference in the best clubs in South Beach, in this regard a particular thanks goes to my great friend and Deejay Helen Brown who gave me this fantastic gift. This passion for music will never cease to amaze me and I will continue to follow it. It is stronger than a drug but it will certainly never hurt, it is and will always be a beneficial medicine!